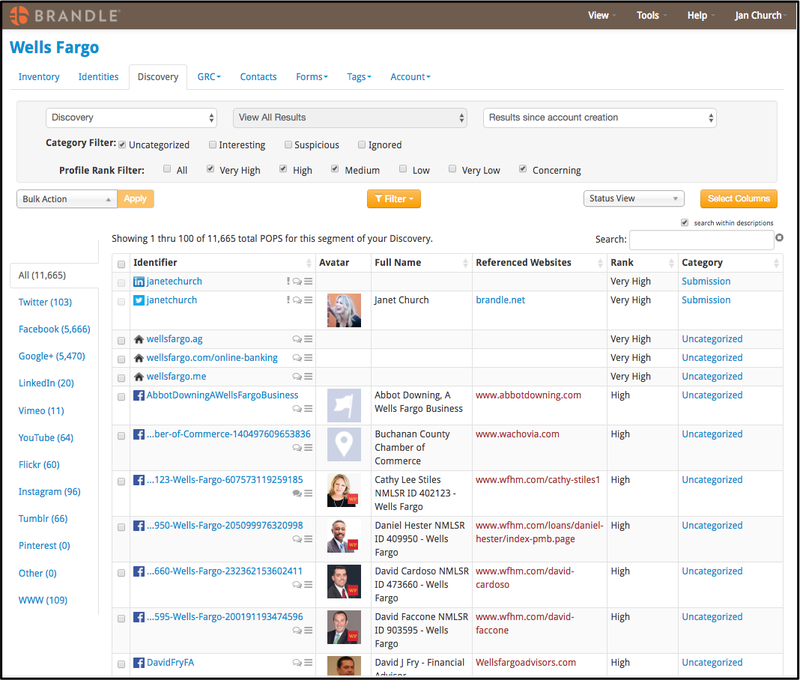 Social Media Audit Tool | Presence Manager | Brandle Inc. 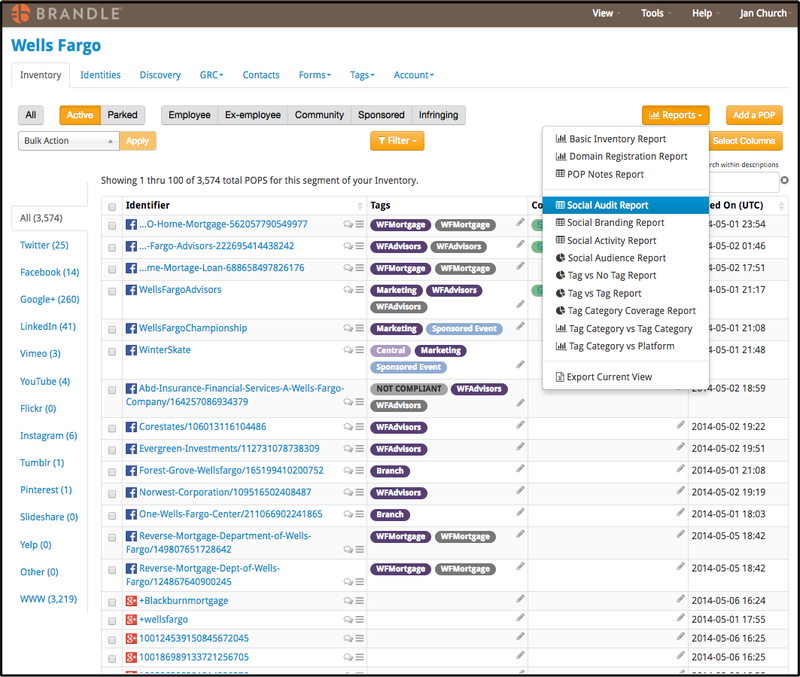 The Brandle Presence Manager is a social media security SaaS solution that allows companies to discover, inventory, monitor and report on their web and social media presence. These web properties may be representing a brand, company or person and should be considered as either assets or risks to your company! Brandle automatically conducts Discovery on Facebook, Google+, Twitter, Vimeo, YouTube, Instagram, Flickr, Pinterest and Tumblr. Brandle also searches for websites, domains and blogs that use your brand names in the URL. Once Brandle Discovers these points-of-presence (POPs), you can place them in Inventory to continue monitoring and managing them. Brandle will update the Inventory for profile changes, audience size, posting dates, and more. There is no need to keep a static spreadsheet or registry with your Brandle Living Inventory. The more you work with Brandle, the stronger the Brandle algorithm becomes, ensuring better social media governance, brand protection and social media security on the brands and identities you care about most! Brandle audits the web for your corporate web presence by looking for points-of-presence that match your company name, brand, or campaign— authorized or unauthorized. Profile Rank grades each discovered POP and shows you the likelihood of a match with your company, allowing you to prioritize. 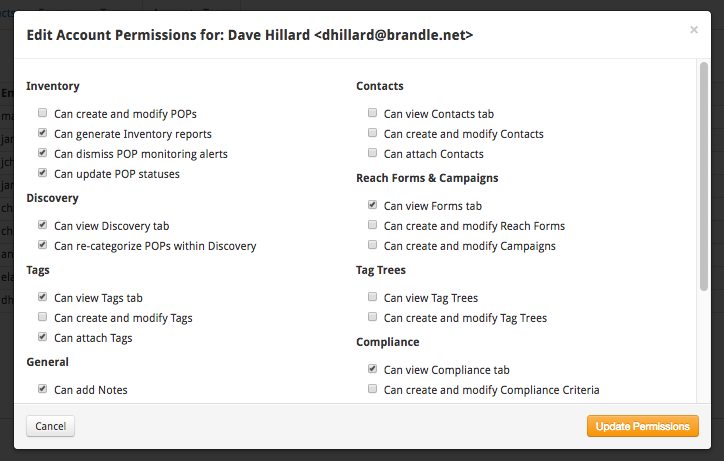 Brandle Campaigns allow your employees to submit their existing and new POPs for monitoring. Scan the avatars for brand recognition and review the last Activity date to determine the priority of managing a POP. Place the POPs you'd like to monitor into your Inventory by selecting a Category or keep them in a review process in Discovery. Inventory social properties and domains as Corporate Active or Parked Property, or as third-party POPs in Employee, Advocate, Community, Partner or even Infringing rogues. 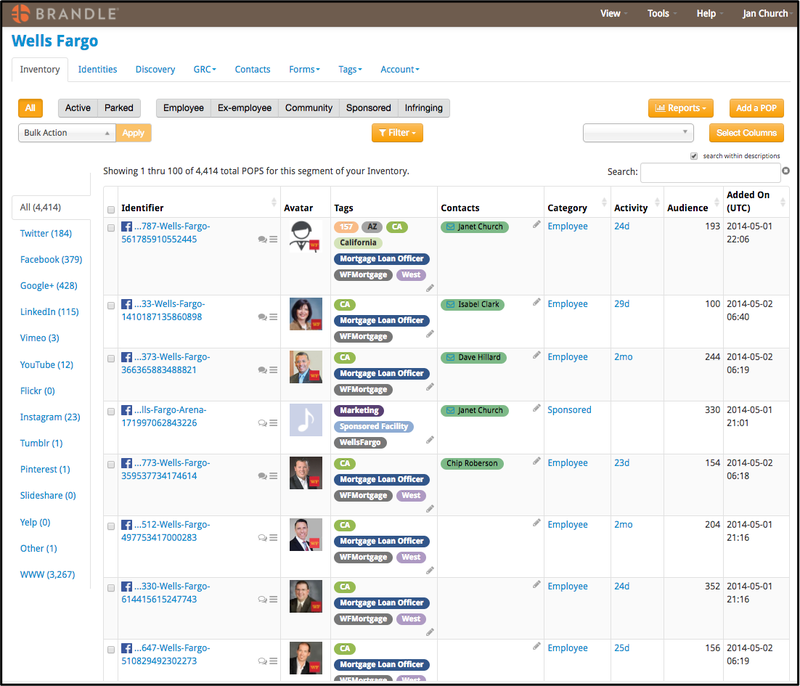 Brandle automatically places your social POPs into twelve different social network areas or as WWW. Upload known POPs from other platforms can be placed in the Other area giving 100% coverage of your Inventory. Receive email alerts when changes are made to the profiles on POPs. Monitor audience size, last activity date, and the health of the POP (we call POP Pulse). Create Tag Categories & Tags. Tag each POP so you can organize and pull reports that matter most to your company. Keep Notes on each POP. Brandle keeps a historical record of each entry made. Generate Inventory Reports that matter most: social media success by brand or region, reports by social network, domain reports, risk management process reports, POP Notes reports, and tag comparison reports. Pull Key Performance Indicator reports by person to track progress or by date range for activities. Review the Event Log by date range to see all work in process, performed by the Brandle Presence Manager or a team member. There are many stakeholders across an enterprise that take part in a company's web presence including Marketing, HR, Legal, Sales, Customer Support, and more. With Brandle, everyone can work with the information they need to do their job. Assign a Brandle Role to any user, such as Administrator, Entity User, or View-only User. For Entity Users, select specific permissions and scope to ensure tasks are accomplished correctly. Communicate with Contacts (employees, partners, advocates, etc.) even if they are not users in the system. Apply Notes to POPs that contacts can read and act on (such as changing a Twitter avatar to a new logo).